Our customer found an issue on ADAU1451 SigmaDSP, the RMS table seem have problem. 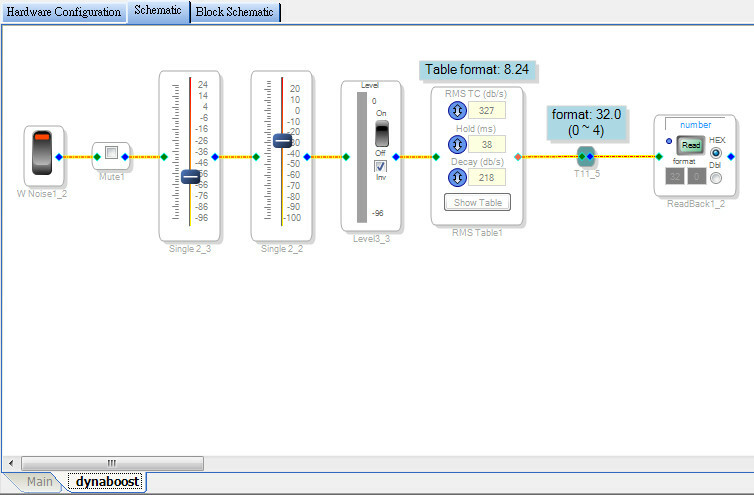 When RMS Table choose index 1 (means -90dB), the output of RMS table is wrong and change repeated. For example, please see attached .dspproj file, RMS table should output 5.96E-08 on format 8.24 (i.e. 0x00000001 on binary) when input = -90dB. But as attached video show, it output wrong value (ex. 0xE4F4A25A on binary). Note every other index (2~33) are all correct. Sometimes after boot up , index 1 is correct. But wait a while, index 1 have problem again. Could you confirm if it is a bug. If yes, how could our customer workaround it? Thank you for your response and your attached re-worked project.